Lauren Snapp is a Family Nurse Practitioner who joined Johnson City Internal Medicine in November 2017. She received her undergraduate degree from East Tennessee State University before obtaining her Masters of Science in Nursing. She is ANCC certified. 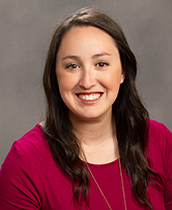 Lauren brings with her 7 years of experience in critical and acute care. She has cared for a wide range of patients during her career. She believes in building a long lasting and trusting relationship with JCIM patients and their families. Lauren feels it is important to acquire a comprehensive evaluation on every patient by taking the time to listen and understand their particular needs. She has a true desire to provide a positive healing experience and provide a patient oriented care plan. In her spare time, she enjoys spending time and traveling with her husband and dogs. She also enjoys reading and kayaking.